Prospective employees are chosen based upon strict criteria and guidelines developed over many years of experience. All prospective employees are pre-screened. A minimum of three (3) non-family personal references and five (5) years previous employment and professional references are required upon application for employment. We require all applicants be at least 18 years of age if non-commissioned and 21 years of age if commissioned to carry a firearm. All prospective employees are tested for literacy and are fluent in English. Each one understands, reads and writes English intelligibly. 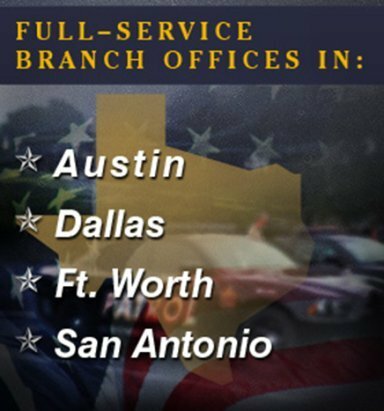 Each applicant undergoes an independent criminal background check by the Texas Department of Public Safety – Texas Private Security Bureau, and is issued either a Non-Commissioned or Commissioned registration card. This criminal history check consists of a State and Local check by the Texas Department of Public Safety (TxDPS) and a Federal check is also conducted by the Federal Bureau of Investigation (FBI). All officers are free of felony and misdemeanor convictions involving moral turpitude. 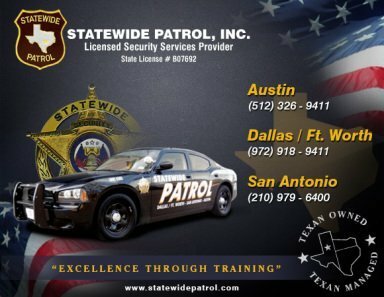 Every employee of Statewide Patrol, Inc. is eligible to work in the United States. Each one is required to complete INS Eligibility Verification Form I-9, required by the INS pursuant to the 1986 Immigration Reform and Control Act. Every effort is made to ensure that each member of our staff has the highest level of integrity, quality and background. Department of Public Safety – Private Security Bureau, Statewide Patrol, Inc. performs random drug and alcohol screenings to ensure the continuing quality of our personnel. We apply the most stringent standard in the industry to our hiring process. Thorough criminal history check on State and Federal level. Those who pass must then attend extensive orientation and training classes and go through pre-assignment training taught by experienced, certified instructors. They must pass a test on every subject before they are considered for a position with Statewide Patrol. Every applicant must undergo an intense and comprehensive screening process to ensure they meet our high standards. If you are looking for a job in the security industry and think you are Statewide material, download our APPLICATION FOR EMPLOYMENT (by clicking on the button below), complete it and bring it to one of the addresses listed on the Application.